Italian student of Jewish literature;. born at Celleno April 1, 1613; died Oct. 19, 1687. 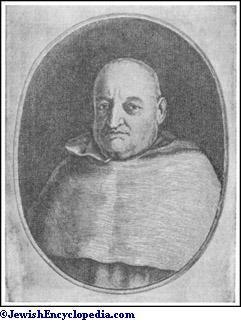 He was a pupil of a baptized Jew, Giovanni Battista, who instructed him in Hebrew; and on completing his studies he became a priest of the Cistercian order. 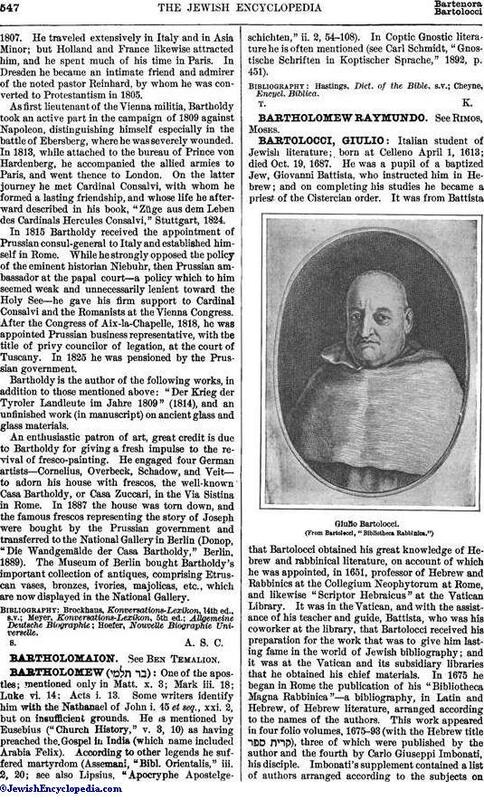 It was from Battista that Bartolocci obtained his great knowledge of Hebrew and rabbinical literature, on account of which he was appointed, in 1651, professor of Hebrew and Rabbinics at the Collegium Neophytorum at Rome, and likewise "Scriptor Hebraicus" at the Vatican Library. It was in the Vatican, and with the assistance of his teacher and guide, Battista, who was his coworker at the library, that Bartolocci received his preparation for the work that was to give him lasting fame in the world of Jewish bibliography; and it was at the Vatican and its subsidiary libraries that he obtained his chief materials. In 1675 he began in Rome the publication of his "Bibliotheca Magna Rabbinica"—a bibliography, in Latin and Hebrew, of Hebrew literature, arranged according to the names of the authors. This work appeared in four folio volumes, 1675-93 (with the Hebrew title ), three of which were published by the author and the fourth by Carlo Giuseppi Imbonati, his disciple. Imbonati's supplement contained a list of authors arranged according to the subjects onwhich they wrote. The latter added to this work a fifth volume, the "Bibliotheca Latina Hebraica," Rome, 1694, which contained the works and the names of Christian authors who had written in Latin on Jews and Judaism. It was from Battista that Bartolocci obtained the idea and plan of the "Bibliotheca Magna Rabbinica," as well as part of the material. Battista began the composition of the book in a chronological order, which order was abandoned by Bartolocci. Richard Simon, in writing in his "Bibliothèque Critique" about Bartolocci's work, says: "It contains much of Jewish learning, but little of judgment, and is conspicuous for a profound ignorance in the most common matters that concern criticism. "Complaints were also made that he devoted too much space to refutations of Jewish arguments and that his translations from the Talmud were faulty. On the other hand, Wolf attributes to Bartolocci the motive and stimulus for his own work, which has more than superseded Bartolocci's. 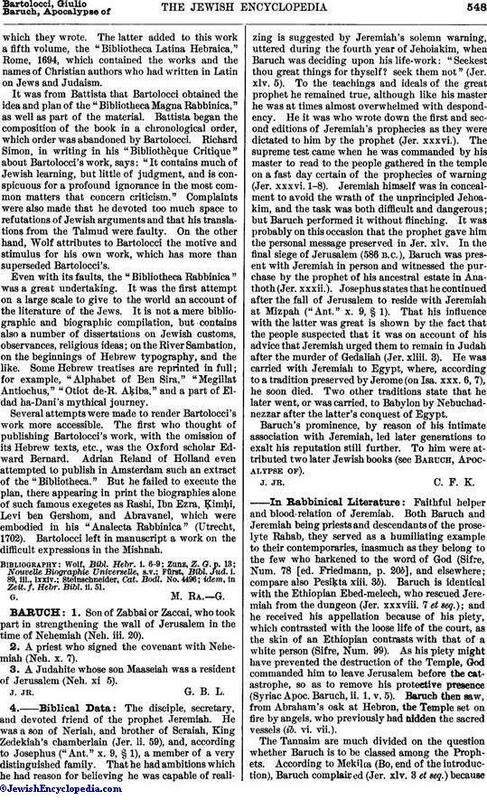 Even with its faults, the "Bibliotheca Rabbinica" was a great undertaking. It was the first attempt on a large scale to give to the world an account of the literature of the Jews. It is not a mere bibliographic and biographic compilation, but contains also a number of dissertations on Jewish customs, observances, religious ideas; on the River Sambation, on the beginnings of Hebrew typography, and the like. Some Hebrew treatises are reprinted in full; for example, "Alphabet of Ben Sira," "Megillat Antiochus," "Otiot de-R. Aḳiba," and a part of Eldad ha-Dani's mythical journey. Several attempts were made to render Bartolocci's work more accessible. The first who thought of publishing Bartolocci's work, with the omission of its Hebrew texts, etc., was the Oxford scholar Edward Bernard. Adrian Reland of Holland even attempted to publish in Amsterdam such an extract of the "Bibliotheca." But he failed to execute the plan, there appearing in print the biographies alone of such famous exegetes as Rashi, Ibn Ezra, Ḳimḥi, Levi ben Gershom, and Abravanel, which were embodied in his "Analecta Rabbinica" (Utrecht, 1702). Bartolocci left in manuscript a work on the difficult expressions in the Mishnah. idem, in Zeit. f. Hebr. Bibl. ii. 51.